Hello and Welcome to our preview for the Bangladesh vs New Zealand ODI match. 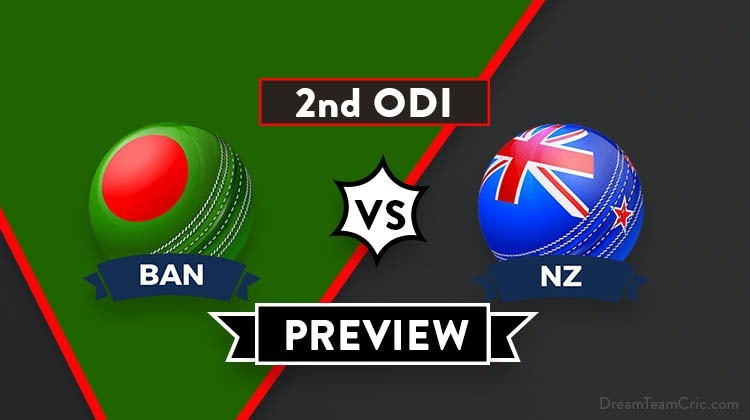 We are covering BAN vs NZ Dream11 team Prediction, Preview and Probable Playing XI for the second ODI match. The match is to be played at the Hagley Oval, Christchurch. New Zealand cruised to an easy eight-wicket win in the first ODI against Bangladesh at Napier. Batting first, the visitors failed to cope up with the conditions. Despite the late recovery, the score was not daunting. The Blackcaps chased it down sensibly. Bangladesh’s big guns – Tamim Iqbal, Liton Das and Mushfiqur Rahim, all returned with only single figures in their account. From 94/6, Mohammad Mithun gave a sterling fight with his 62. M Saifuddin contributed 41 to take the final score to 232 all out. Only Mehidy Hasan shined with the ball while the rest meandered. Playing at Napier, New Zealand bowlers enjoyed a good outing. Henry, Boult, Ferguson and Santner not only bowled economically but picked up wickets as well. Guptill dazzled in the chase with not out 117. Nicholls and Taylor played the supporting role. With a win in the second ODI, NZ will hope to clinch the series and experiment in the third ODI. The last ODI here was played between ENG and NZ in March 2018. NZ was all out for 223 and Eng chased it down with seven wickets remaining. Shakib Al Hasan had a finger injury in BPL and is ruled out of the ODI series. Bangladesh is unlikely to tinker with the batting lineup, they deserve another chance. Tamim Iqbal and Liton Das should be starting Bangladesh’s inning. S Sarkar bat at three. Wicketkeeper Rahim, Mohammad Mithun, Mahmudullah and Sabbir Rehman complete the middle order. Mehidy Hasan shall be the primary spinner. Mortaza and Mushfiqur will be the pace pair. Mohammad Saifuddin could get another chance after the good batting performance. Rubel Hossain shall wait in the sidelines. Guptill and Nicholls open the inning. Williamson and Taylor form a stupendous duo at the top. Latham will keep wickets and shall bat at number five. Neesham, C de Grandhomme and Mitchell Santner form all-round trio. Matt Henry, L Ferguson and Trent Boult played in the last match. NZ could rotate one of them with Tim Southee to manage workload. Ross Taylor is also good pick. Captain and Vc choices: K Williamson, Trent Boult, M Guptill, H Nicholls, Ross Taylor, T Iqbal, Liton Das, Colin de Grandhomme, M Rahim. If you liked BAN vs NZ Dream11 team prediction, then follow us on Twitter for Latest Cricket News and Grand Leagues Teams.